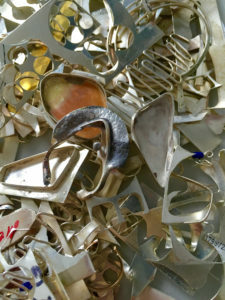 How Does the Jewelry Design Process Begin? One might think that designing a jewelry collections starts with an idea. However, it is often the process of jewelry fabrication that leads to that idea. Take for example, the Mohr Designs’ Fiddlehead Collection. Yes, the collection was inspired by the magical lore of the edible furled fern and it’s beautiful curves. But where did the design process begin? In 2008, I started training to become a goldsmith. The fist step in stone setting is to create a bezel cup. This process involves forming a fine silver wall (bezel) exactly to the stone’s shape and then soldering that wall onto a flat sheet of sterling silver. The techniques of brazing two pieces of metal together requires highly skilled craftsmanship that only comes from hours of practice. Wait too long or use too hot a flame and the piece is melted. Use to cool a flame and nothing happens. The apprentice periodically achieves a perfect bezel cup, but only after melting 10 in previous attempts. After a couple of years learning to set stones, I started looking at a box full of rectangular sheets coated with the melted blobs of a bezel walls and the price of silver, now approaching $50 per ounce compared to the $9 per ounce I paid when I first started training. What to do? I could return the silver to a refiner for a fraction of its value or……let’s experiment! I learned to remove the melted bezel and was left with a sheet of sliver with an earthy organic texture. Hum…looks like there should be some plants or animals in there….hence the idea for the Fuse Flora and Fauna Collection was born! I experimented with soldering pieces of metal to the surface, but it appeared too contrived. I discovered that the best approach was to use the melting of metal as a design tool. I created pictures on the metal surface then torched the entire piece. This fusing process allowed the sides of the sheet to naturally melt into itself and the surface into the picture. 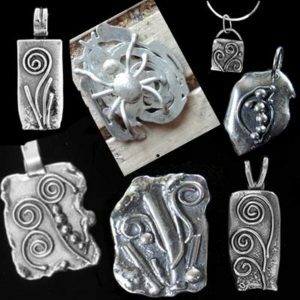 The fiddlehead pendants were the first creation. Then came the spider, the catepillar, the mushroom and cherries! Now, I have only 1 ruined bezel cup for each 10 I make, so the starting materials for the fiddleheads are perfect sheets of metal and the organic look more difficult to achieve. Because these designs were so popular, I wanted some reproducibility in fabrication and decided to create a limited edition casting series to be a part of the Mohr Design’s on-line store launch. 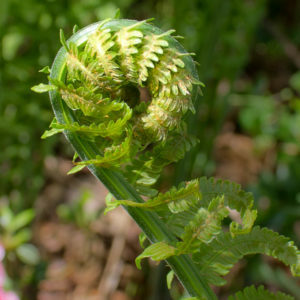 One of my favorite designs was a a single or doublet fiddlehead, surround by the blades of grass. From the stories I had read, I could see the Fairy Fern sitting in the background of this simple design and hear her playing her flute. So I decided to base the collection on fairies. From my childhood, the fairies of Sleeping Beauty, Merryweather, Flora and Fauna were classic. So the pendants with three fiddleheads nestled as one are in honor of these ladies who offer us beauty, song, and love’s true kiss. And how could we talk about fairies without remembering Tinkerbell. The third series reminds of us Tinkerbell, the fairy with a free spirit who always had her friend’s back. So whether you are looking for fashion or fairies, or simply want to explore the creation of a a jewelry collection, check out the Fused Flora and Fauna Collections atwww.mohrdesigns.com/fiddleheads. Which series comes next year? I am leaning toward the caterpillar.